Not sure how to set this up? You can schedule a free half-hour product knowledge session with one of our product experts even before things go horribly wrong. You'll be glad you did! What is a patch management policy? With a patch management policy, you are pre-approving patches to be installed on your Windows devices on an ongoing basis, based on conditions you define. A patch management policy can not only manage the patches made available in Windows Update, but it also gives you much more control, lowers your workload, and increases the security of your device estate. You can set up an Account-level or Site-level policy that can target multiple devices, define the patch window, patch location, automatic approval rules, and special options such as reboot behavior. You can also create a patch management policy for audit purposes only. You can even apply Site-level overriding of Account-level patch policy options. We recommend that you create at least two patch policies: one for workstations and one for servers. For more information on patch management, refer to Patch Management. Although this is option is selected, patches will not be downloaded and run on the targeted devices as the policy is configured to be "Audit only". You can create another Patch Management policy or modify the default one. For more information, refer to Specify the policy details for a patch management policy. If you would like to use a patch management policy to install only the patches you have approved, you need to disable Automatic Windows Update on your devices. We recommend that you create a Windows Update Policy in Datto RMM to achieve this. 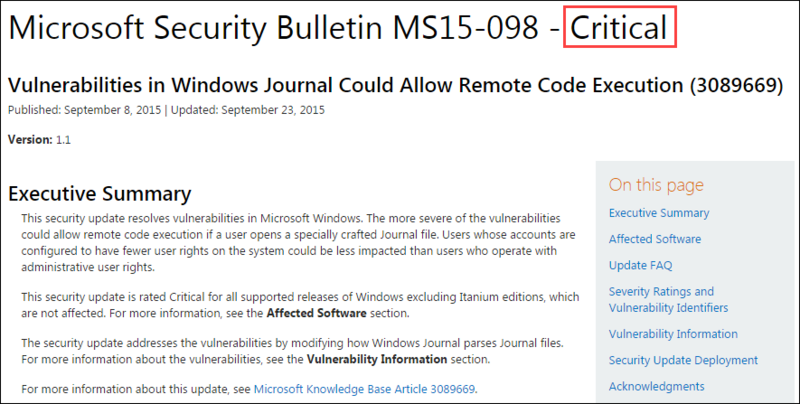 For more information, refer to the Disable automatic Windows Updates section in Create a Windows Update policy. 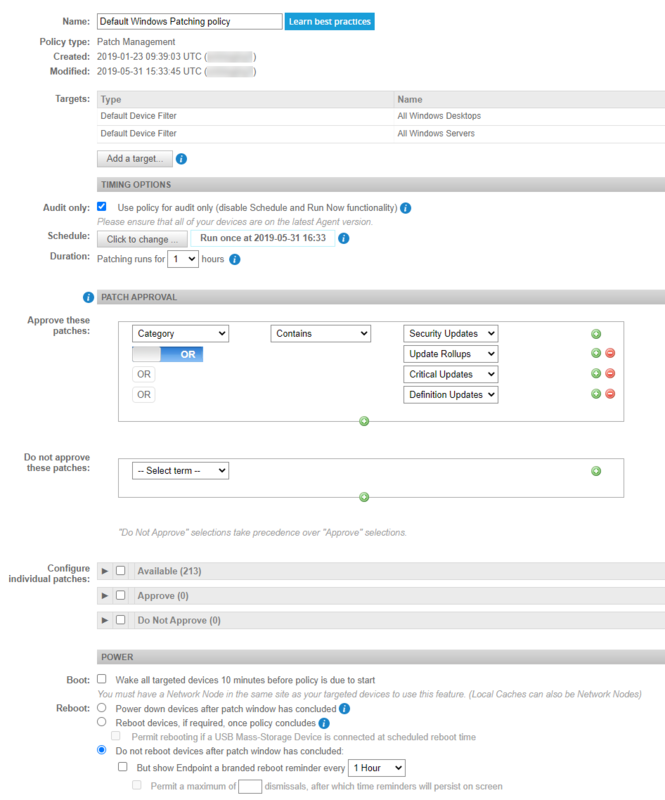 You can then create a patch management policy at the Account or Site level. Refer to Specify the policy details for a patch management policy. Account-level policies can be overridden at the Site level to alter only the most necessary elements for a smaller subset of devices. For more information, refer to Override Account-level patch policy options at the Site level. A Default Patch Management policy is available in all new accounts. To modify the policy details or create a new policy, refer to the steps below. Select the type Patch Management. You can only use an Account- or Site-level policy as a template, that is, you cannot base your policy on a Site-level override of an Account-level policy. For information of Site-level overrides, refer to Override Account-level patch policy options at the Site level. Audit only Select this option to use the policy for audit purposes only. This will allow you to see missing patches on your devices without the ability to (accidentally) run the policy on them. Once this option is selected, it will disable the Schedule and Duration options below, and the Run Now functionality. For more information on Run Now, refer to Patch management at the Account and Site level and Patch management at the Device level. Ensure that all of your devices are on the latest Agent version. This option will be grayed out if the Audit only option has been selected. • At selected date and time - Defaults to the current date and time, but can be changed in the Start field. The policy will run once at the selected date and time. • Daily - The policy will run every day at the time indicated in the Start field. • Weekly - The policy will run every week on all selected days at the time indicated in the Start field. • Monthly - The policy will run in the selected months on the selected days. • Monthly day of week - The policy will run in the selected months on the specified occurrence of the selected days of the week. • Yearly - The job will run on the selected day (1 - 366) each year. Once you click OK, the selected schedule will be displayed next to the Click to change... button. Time zones will be taken into account at run times. For example, if the policy is set to run at midnight and is applied to two devices in different time zones, one UTC and one PST, then the policy will run at midnight UTC on the UTC device and at midnight PST on the PST device. Allows you to put a time limit (1-24 hours) on running the policy. If this time window is overrun, the targeted device will stop installing patches once the current operation has completed. If patches 1-10 should be installed on a device but the set time limit is reached while the installation of patch 6 is still in progress, patch 6 will be installed on the device but patch 7 will not. Patch 7 will resume during the next scheduled policy run. You can run patch management policies outside of schedule on individual devices. For more information, refer to Patch management at the Device level. • Download patches from Windows Update - The targeted devices will contact Windows Update directly to download patches. • Use a Local Cache to download and distribute updates to targeted devices if available - The targeted devices will contact the local patch cache(s) of their sites for updates if a patch cache has been configured. If no patch cache is available, the targeted devices will always be permitted to contact Windows Update to obtain patch data. If you want to use the Local Cache option in your policy, make sure that the sites your targeted devices reside in do have a nominated patch cache. To learn more, refer to Designate a local cache. To learn about patch cache clearing options, refer to Site Settings. Microsoft has introduced a new way to update Windows 10 and Windows Server 2016+ devices. These new-style updates cannot be distributed via a Datto RMM local patch cache and must be downloaded directly from Microsoft. Legacy Windows devices will continue to receive old-style full updates and will defer to a local patch cache first if one has been configured. For more details on these changes, refer to this Community post. A maximum number of eight devices can be patched simultaneously by a local patch cache. The rest of the devices served by the patch cache will queue. Queuing and performance depends on the resources available to the patch cache, as well as on disk and local network speed. Approve these patches Allows you to configure approval filters. Refer to Filter patches. Do not approve these patches Allows you to configure disapproval filters, that is, you can set conditions that override your approval above. These filters take precedence over approval filters. Refer to Filter patches. Configurations such as “Approve critical security patches, but do not approve critical security patches with ‘Defender’ in the title” are entirely possible. Configure individual patches You can use this section to manually override the patches that were approved or denied in the Approve these patches and Do not approve these patches sections above. • Sort - You can sort the patches by clicking on any of the following columns: Title, Release date, Microsoft Security Response Center Priority, Download Size, Reboot behavior, User input. • Patch title - Click the hyperlink to open a page showing all devices that are missing this patch / for which this patch has been approved / for which this patch has been denied (when clicking from the Available / Approve / Do Not Approve list, respectively). • Select - You can select your patches individually by checking the selection box in front of them. You can also select all of the patches listed by checking the Select All check box just in front of the Available / Approve / Do Not Approve drop-down. • Export all patches to CSV - Allows you to export all patches of the respective list in .CSV format. It is not possible to select only certain patches for the export. Once you click on the Export all patches to CSV button, make sure to select/deselect the columns you want to include/exclude in the export. If you have just moved patches from the Available list to the Approve or Do Not Approve list and want to export the updated list to a .CSV file, make sure to save the changes first and then click on the Export all patches to CSV button. This will allow you to see the updated number of patches in each list's export. Other configuration options specific to each list are discussed below. This drop-down lists all patches that have been submitted to the platform. The number of patches is displayed in brackets next to the list name. The patches are collected from the audit data of all of the devices in the entire account/site, that is, they are not filtered by the criteria defined in the approval and disapproval sections above. This section allows you to configure individual patches regardless of any previous filters. For example, you can approve a patch here that would have been excluded through a disapproval filter above. • Approve - Approving a patch will remove it from the Available list and place it in the Approve list. • Do Not Approve - It will remove the patch from the Available list and place it in the Do Not Approve list. This drop-down lists all patches that have been approved through the Available list. The number of patches is displayed in brackets next to the list name. The patches listed are not filtered by the criteria defined in the approval and disapproval sections above. This section allows you to configure individual patches regardless of any previous filters. • Remove from list - It will remove the patch from this list and push it into the Available list again, where it can be approved or disapproved by the filters above it. You can hover over a patch and click on this icon at the end of the row, or you can select one or more patches and click on this icon in the Actions bar. This drop-down lists all patches that have been denied through the Available list. The number of patches is displayed in brackets next to the list name. The patches listed are not filtered by the criteria defined in the approval and disapproval sections above. This section allows you to configure individual patches regardless of any previous filters. • Wake all targeted devices 10 minutes before policy is due to start - You must have a network node device in the same site as your targeted devices to use this feature. (Local Caches can also be nominated as network nodes.) If multiple network nodes are nominated, all will send requests. Be aware that Wake-on-LAN must be enabled in BIOS/EFI and typically only works for laptops when they have an active mains connection. For more information, refer to Wake-on-LAN and Nominate a device as a network node. • Power down devices after patch window has concluded - it will shut down the targeted devices after the patch schedule window. • Reboot devices, if required, once policy concludes - If necessary, it will reboot the targeted devices after the policy has run. • Permit rebooting if a USB Mass-Storage Device is connected at scheduled reboot time - This option becomes available if the "Reboot devices..." option has been selected. Do not select this option if you want to cancel reboots when USB sticks are inserted. This will stop servers from rebooting into a LiveUSB. You can always search for devices requiring a reboot using a Default Device Filter. 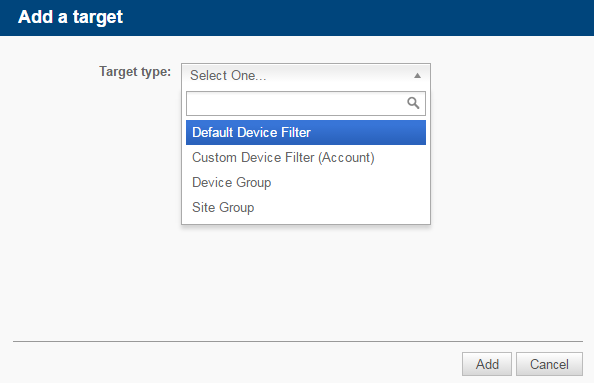 Refer to Default Device Filter definitions. • Do not reboot devices after patch window has concluded - This option is selected by default. It will stop the targeted devices from rebooting after the patch schedule window. • But show Endpoint a branded reboot reminder every X hour/day - This option becomes available if the "Do not reboot devices..." option has been selected. It allows you to show a branded reboot reminder to the end user every 1-12 hours/1 day/2 days. The reminder will be displayed on the screen until the end user dismisses it. The reminder can be dismissed indefinitely. • Permit a maximum of X dismissals, after which time reminders will persist on screen - This option becomes available if the "But show Endpoint..." option has been selected. It lets you configure how many times (maximum two-digit integer) the end user is allowed to dismiss the reboot reminder, after which they will no longer be able to dismiss it. If this option is enabled but no value is set, then the default value of 1 will be used, that is, the end user will be able to dismiss the reminder only once and the second reminder will persist on the screen. The branding for the reminder is taken from the Patch Reboot Window image on the Branding page. Refer to Branding. Account-level patch policies can be overridden at the Site level. This allows you to change settings at the Site level without modifying the master (Account-level) policy. Navigate to any of your sites and click on the Policies tab. You will be presented with both Account and Site Policies. Locate your Account-level patch management policy and click on the Override button, or on the Edit Override button if the patch policy in question already has an active override. An active override is also indicated by the Override active button in front of the policy. A patch management policy that is only active at the Site level will not have an Override button (and any Override sections within the policy). Name These fields cannot be edited. The targets of the policy are inherited from the Account-level policy. Override Turn it ON to be able to edit the settings below. If you turn it OFF again, the settings will revert. Audit only These sections become available as soon as the Override button is turned ON. For information on the configuration options, refer to TIMING OPTIONS. Local Cache This section becomes available as soon as the Override button is turned ON. For information on the configuration options, refer to PATCH LOCATION. Add Rule Turn it ON to be able to edit the settings below. If you turn it OFF again, the settings will revert. Approve these patches These sections become available as soon as the Add Rule button is turned ON. For information on the configuration options, refer to PATCH APPROVAL. Boot These sections become available as soon as the Override button is turned ON. For information on the configuration options, refer to POWER. You can also configure individual patch installations at the Device level, permitting exclusions or tolerances for individual patches. Refer to Patch management at the Device level. Your patch management policy can use filtering criteria to determine the patches that should be installed on the targeted devices. All This selection will include all patches. • Applications - Releases relating to specific applications that receive updates via Windows Update. • Connectors - Software that helps establish links between endpoints and a server running Windows Server software. • Critical Updates - Non-security-related updates that help maintain the operation of a system. • Definition Updates - Updates for Windows Defender malware definitions. These are disabled when the endpoint is using alternative antivirus software. • Drivers - Driver updates to ensure Windows can communicate properly with the hardware connected to it. • Feature Packs - Packs designed to unify Windows versions' functionalities outside of full service pack releases. • Security Updates - Updates that help maintain the security and safety of a system. These should be installed as soon as possible. • Service Packs - A collection of individual updates for issues reported both internally and from Microsoft customers. • Tools - Utilities or features that help to complete a task or set of tasks. • Update Rollups - A collection of individual updates designed to target a specific element (e.g. security) of Windows. • Updates - Updates that are neither critical nor security related, but which deliver a fix for a reported issue. Use any of the following qualifiers: Contains, Does not contain, Is empty, Is not empty, Begins with, Does not begin with, Ends with, Does not end with. Description Allows you to filter by the description of the patch. Use any of the following qualifiers: Contains, Does not contain, Is empty, Is not empty, Begins with, Does not begin with, Ends with, Does not end with, Equals, Does not equal. Download size You can limit the download size of the patch to a certain number of gigabytes, megabytes, kilobytes, or exact number of bytes. Use any of the following qualifiers: Less than, Less or equal, Equal to, Greater or equal, Greater than, Between. 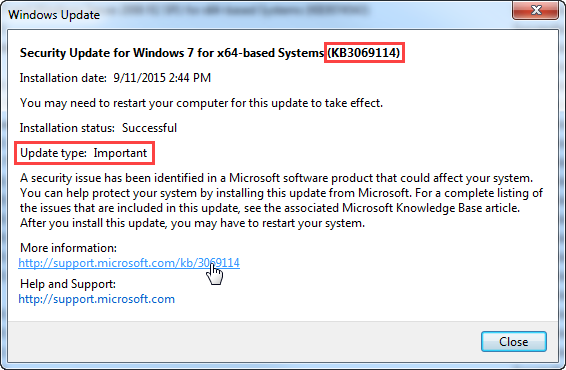 KB number Allows you to search for a specific Microsoft Knowledge Base article number the patch is associated with. Priority (Microsoft Security Response Center Priority) Allows you to filter by Microsoft Security Response Center Priority as specified in Microsoft Security Bulletins. Select any one of Critical, Important, Moderate, Low, Unspecified. Datto RMM patch management policies reference Security Bulletin classifications, not the severity specified by Windows Update. Refer to About Microsoft Update classifications. Reboot behavior Select from Never reboots (0), Always requires reboot (1), and Can request reboot (2). It allows you to avoid pushing changes that require a reboot during business hours. Release date Allows you to filter for patches released before or after a certain date, or older than 7, 14, 30, 60, or 90 days. Request user input Select either May require, or Does not require. If you filter for patches that may require user input, schedule them to install during business hours. Title Allows you to filter by the name of the patch. Type Allows you to filter by patch type. Select either Software or Driver. If both conditions must be true for the patch to be included in the search results, select AND. If either one must be true, select OR. Standard SQL dictates that grouped queries on a positive criterion (e.g. "Title contains 1", "Title contains 2", "Title contains 3") need to be grouped with OR. For example, "Title contains 1 OR 2 OR 3" will return patches whose title contains either 1 or 2 or 3. Negative queries (e.g. "Title does not contain 1", "Title does not contain 2", "Title does not contain 3") need to be grouped with AND. For example, "Title does not contain 1 AND 2 AND 3" will only return patches whose title contains neither 1 nor 2 or 3. Set up a Patch Monitor to get an alert when a device fails to install any patches as part of a Datto RMM patch management policy. Refer to Patch Monitor. Microsoft uses two different security classification systems for their knowledge base articles. 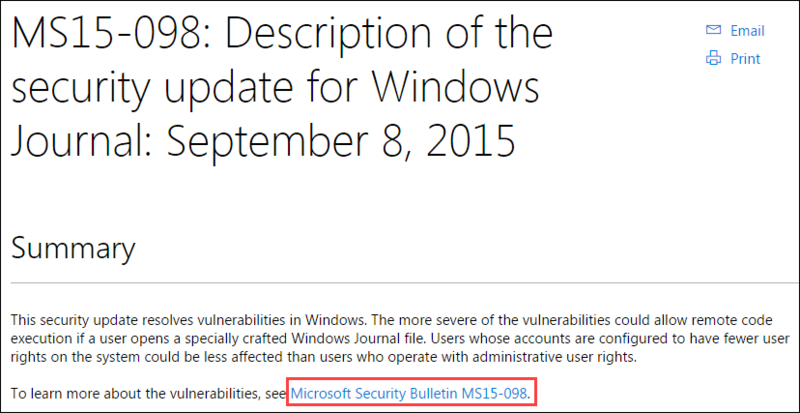 The update type in Windows Update is shown as Important, but on the Security Bulletin, it is shown as Critical. Datto RMM uses the Security Bulletin classifications (Microsoft Security Response Center Priority) from the Security TechCenter library, not the update types from Windows Update. This error only appears when endpoints access the Windows Update section of the Settings menu, which should no longer be a necessary step as updates are delivered automatically without needing the involvement of Microsoft’s own patch management routines. We have sourced the issue to the particular method we use to place patches in the update cache directory of Windows. While thoroughly tested and 100% functional in all cases, it triggers this issue. The error is meaningless, and can be dismissed without concern. Re-checking for updates will clear it from this interface. Patches that trigger this error will have been installed without issue. Until Microsoft fix this issue, the error will be shown when endpoints look for it. We apologize for any inconvenience this may cause. Updates for Windows 10 devices must be handled differently from the operating systems that came before it. For more information, refer to Patch Management and Windows 10.